Thousands of people took to the streets of Istanbul to protest the results of the referendum that extended powers of Turkish President Recep Tayyip Erdogan. Meanwhile, Erdogan celebrated his anticipated victory, telling international observers not to interfere. 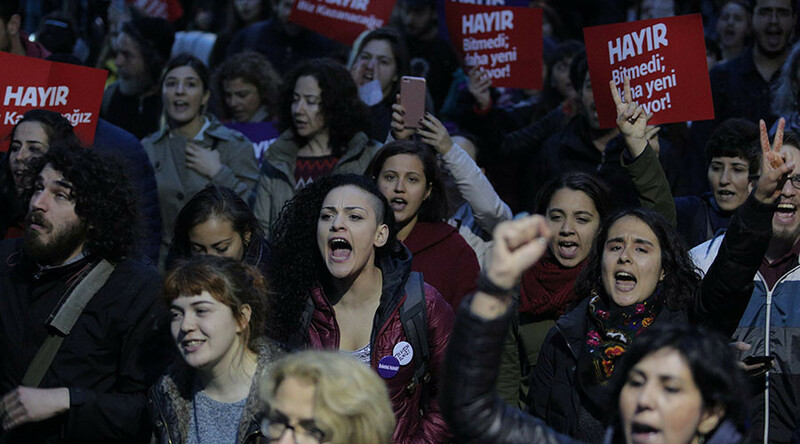 The crowd of angry demonstrators chanting “No, we won,” numbering some 1,000 people, marched through Istanbul’s neighborhood of Besiktas on Monday evening. As the activists proceeded through narrow alleys the locals cheered at them, with some hurling flowers in support. — özcan62yaman (@ozcan62yaman) 17 апреля 2017 г. A large banner reading “No has won” was spread by the activists, who claim the referendum was effectively rigged by the government, which introduced changes to the voting procedure as the referendum was about to commence. — Steve Sweeney (@SweeneySteve) 17 апреля 2017 г. About 2,000 people waving red banners with “The “No” is not finished” written over them took to the streets in Kadikoy, in Istanbul’s Asian quarter, shouting “We are shoulder to shoulder against fascism.” The procession headed to the office of Turkey’s High Electoral Board, which found itself at the center of post-referendum outrage by the ‘NO’ camp. — Turkey Untold (@TurkeyUntold) 17 апреля 2017 г. The fraud allegations stem from a decision by the board on Sunday to count as valid some 1.5 million ballots with no official stamp thus inciting anger of the opposition and drawing criticism from the international observers. — ahmet (@amedowski) 17 апреля 2017 г. — Mahir Ce (@mahirce61) 17 апреля 2017 г. Besides the controversy with the unstamped ballots, which the Turkish government blamed on purely technical issues, the referendum failed to meet the standards of a “genially democratic” one, largely due to the continuing state of emergency that allows government to limit freedom of assembly and other civil rights. “The 16 April constitutional referendum took place on an unlevel playing field and the two sides of the campaign did not have equal opportunities,” the OSCE said in its preliminary conclusions, while the head of PACE delegation Cezar Florin Preda said that the “referendum did not live up to Council of Europe standards." Some 13 people were reportedly detained as violence broke out at an anti-Erdogan rally in resort city of Antalya on the Turkish Mediterranean coast. — isyandan.org (@isyandan_org) 17 апреля 2017 г. Meanwhile, the Turkish leader, who embarked on celebratory rallies as soon as the preliminary results were unveiled, brushed off the criticism, saying that he “did not see, hear or acknowledge” OSCE reports and advised them to not meddle into Turkish internal matters. “First, know your place. We won’t see or hear the politically motivated reports you prepare,” Erdogan said on Monday, lambasting the OSCE’s unfavorable estimate of the referendum’s conduct by the government. — Kemal (@disq) 17 апреля 2017 г. “The crusader mentality in the West and its servants at home have attacked us,” he added. Erdogan went on to say that the EU membership talks, which have been effectively stalled since the Turkish foiled coup and subsequent crackdown on opposition, are no longer a priority to Ankara so it does not care if they stop altogether. — Esin Tekbas (@esintekbas) 17 апреля 2017 г. “For 54 years, what did they make us do at the EU’s door? Wait!” Erdogan told his supporters gathered in front of the presidential palace in Ankara on Monday, adding that Turkey might move forward with the plans to hold referendum on its EU membership bid. With that, the Turkish president hinted that the intervention into Syria should be viewed as one of many more military operations to come. While German Chancellor Angela Merkel has called on the Turkish authorities to “seek respectful dialogue with all political social forces in the country,” warning both sides against escalation in a timid statement, US President Donald Trump was one of the first western leaders to make a congratulatory call to Erdogan on Monday. In the aftermath of the call, the White House issued a statement, saying that Trump has “congratulated [Erdogan] on recent referendum victory” and thanked for supporting US military strike in Syria. Along with Trump, Saudi King Salman bin Abdulaziz also extended his congratulations to Erdogan on Monday, according to the Saudi Press Agency.